Tens of thousands of people have attended a parade in Dublin commemorating the 1916 Easter Rising against British rule. The Easter Sunday parade, which features 2,500 military personnel, is the first in Dublin for 37 years. Wreaths have been laid and a minute's silence was held in commemoration of all civilian and military personnel, including the British, killed in 1916. Irish premier Bertie Ahern and President Mary McAleese attended. Mr Ahern said the commemorations would give an opportunity for "remembrance, reconciliation and renewal". He said those participating would "fittingly commemorate the patriotism and vision of those who set in train an unstoppable process" which led to Ireland's political independence. 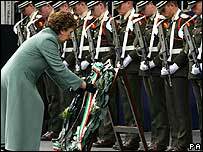 The ceremony marked the start of events in the Irish Republic to commemorate the rising. Military personnel, some saluting atop tanks and others marching with fixed bayonets, paraded past the bullet-scarred spot where rebels mounted the rebellion. The streets along the route were lined by tens of thousands of spectators, while hundreds of thousands more watched live on television. Mr Ahern laid a wreath in Kilmainham Jail as a mark of respect to the men executed after the revolt. The BBC's James Helm in Dublin said the parade had stirred up debate about the revolt and how Dublin should mark its anniversary. In the early 1970s, during the Troubles, the military parades were stopped and official commemorations became more low key. 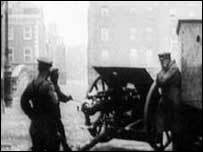 The 1916 Easter Rising saw Irish rebels attempt to seize the capital from British imperial forces.